Netflix has released a full-length trailer for Chilling Adventures of Sabrina season 2. This is actually being billed as a "Part 2," which implies that it will tell a more complete story when looked at side-by-side with season 1. In any event, we've got some more witchy adventures on the way, with former Mad Men star Kiernan Shipka back again as the titular witch. This new footage, set to the tune of Cherry Bomb, as made famous by The Runaways, goes full-on dark Harry Potter and gives fans an awful lot to think about. The trailer is dark in every which way. Lots of dark imagery, people doing very dark things and, often times, quite literally just dark, in terms of the actual lighting. There is honestly so much being thrown at us it's hard to really process it all. Lots of creatures, blood, intriguing images with little context. The biggest thing, overall, is Sabrina very much embracing her powers. This footage has a lot going on and, though it does give a much better sense of what to expect from season 2, it really doesn't reveal all that much. Netflix is going to make everyone wait until the new episodes drop before really showing their hand on this one. Chilling Adventures of Sabrina season 2 centers on our titular character exploring her darker side (which is made very evident in the trailer), while struggling to find a balance between her social life in the human world and also exploring her heritage more deeply. At the same time, she finds herself tangled up in a messy love triangle between Nicholas Scratch and Harvey Kinkle. To further complicate things, The Dark Lord, Madame Satan and Father Blackwood continue to drum up further chaos, while others out there are also trying to stir up the pot. The cast includes Miranda Otto (The Lord of the Rings: The Return of the King), Lucy Davis (Wonder Woman), Ross Lynch (My Friend Dahmer), Michelle Gomez (Doctor Who), Chance Perdomo (Longfield Drive), Jaz Sinclair (Slender Man), Richard Coyle (Coupling), Tati Gabrielle (The 100), Abigail Cowen (Wisdom of the Crowd), Lachlan Watson (Nashville), Bronson Pinchot (Beverly Hills Cop), Gavin Leatherwood (Wicked Enigma) and Adeline Rudolph. Roberto Aguirre-Sacasa (Riverdale) serves as writer and executive producer of the series. Netflix has already renewed it through season 4, so we're really just getting started. Sabrina made her debut in the Archie Comics universe alongside the characters featured in The CW's Riverdale. Originally, this series was developed at The CW as a Riverdale spin-off, but the network decided not to proceed. Their loss turned into Netflix's very big gain. Even though they don't release ratings figures, this show has proved to be a major favorite amongst subscribers. 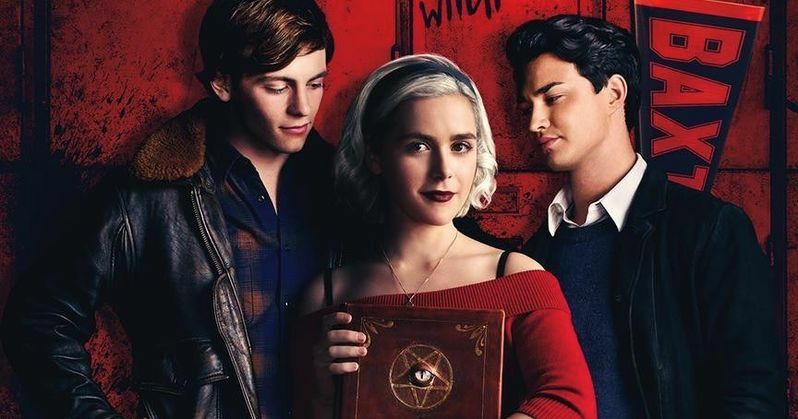 Chilling Adventures of Sabrina season 2 is set to arrive on April 5. Be sure to check out the new trailer from the Netflix YouTube channel below.